Sorry, this adventure is now fully booked but you can still add yourself to the waiting list and be automatically notified if a place becomes available. 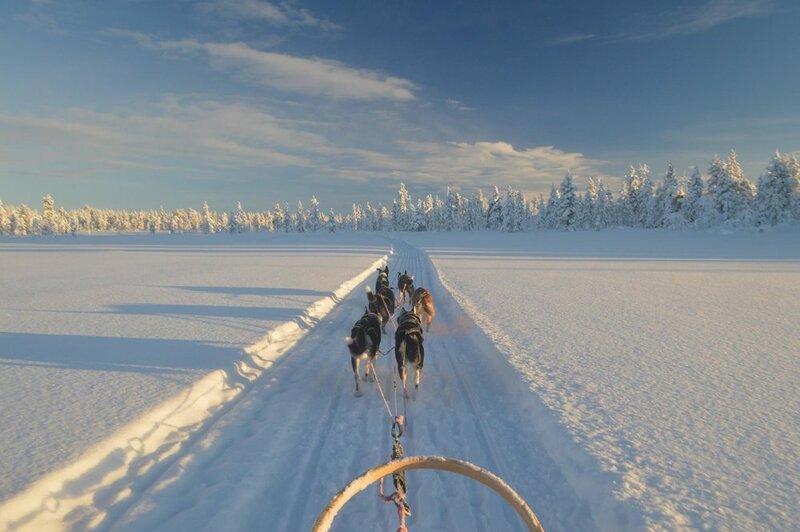 Learn how to mush your own team of sled dogs on this epic five-day adventure in the heart of Arctic Finland - spend your days exploring tundra, forests, lakes and rivers and spend your nights in cosy log cabins under the stars. A once-in-a-lifetime experience! Hold on tight for this full-on five-day adventure, with plenty of mushing and only four days off work! This trip is short but intense - not only will you get a three-day wilderness safari with your own sled dog team but from the first evening you can learn all about the dogs’ routines and get hands-on behind the scenes of the farm. By the end of this unforgettable trip you’ll have formed a special bond with your dogs and learned to be a confident musher! Due to the nature of the safari there are only 8 spaces – don’t miss out on this! After arriving at the farm, your host will greet you and give you all the kit and clothing you will need, talk to you about keeping safe and warm in the Arctic and then introduce you to the farm and dogs. There will be a briefing the next morning about the safari itself where all your questions will be answered. That night everyone will be staying in a farm ‘kota’ and all of your bags will go down with you. The kota is a traditional circular log building with a central fireplace over which we will cook the evening meals for the first two nights. If you want to get involved in feeding the dogs on the first night (between 5 - 8pm) you can shadow a mentor during the feeding session, or you can just hang out by the fire in the kota whilst waiting for dinner. Please note if you do help with feeding the dogs your own dinner will be a bit later so you might want to have snacks handy, but the experience is worthwhile! With breakfast already laid out for you in the kota, you can either have a relaxed start to the day or help with giving the dogs their breakfast (the dogs need a clear 2-hour window between eating and being able to run so you’ll need to be up very early!). If you’re not joining in with the feeding you’ll prepare your kit for the day or head outside to watch (or join in with) the remainder of the morning routines. Everyone will gather together at around 10:30am for an official introduction and a basic check of kit before beginning the safari. You’ll start with a session on how to drive sleighs and how to put your dog team together – throughout the week you’ll build upon this knowledge so that by the end you’ll be a pretty competent musher! After the team-building session you’ll head off into the wilderness, led by your guide on a dogsled in front and accompanied by an additional guide on a snowmobile. This introductory day safari will include around 30km of riding relatively close to the farm, with lunch served in a wilderness cabin. Once back at the farm in the evening you’ll have warm drinks and snacks, and you can either relax before dinner with books and board games or really get stuck in to experiencing life on a husky farm. Later that night, there will be a talk about cold safety and awareness and equipment choices linked to the kit you will have already tested that day. You’ll probably find you have more than you need so you can leave behind anything you don’t need at the farm. We will also introduce a map of the route you will take over the following two days and talk about key highlights and challenges from each day. If you are still interested in learning more, we will move onto the topic of sled-dog welfare and talk about some of the specific actions we take to care for the dogs on the farm. This is the first morning when everyone starts together at the farm – you can help out with the dogs again or have a leisurely morning. On the second morning you still have the option to either relax or help out with the dogs again before packing up the kota and carrying out one final kit check. Your lead guide will have been packing the food for the overnight location but there will be other guides at hand to help you to get ready. When you’ve loaded up your personal sleigh bags, and the dogs are massaged and ready to go, it will be time to head off into the wilderness. We have a number of possible route options – primarily dependent on cabin availability and snow conditions – but we stop regularly on all routes for coffee and snacks and for lunch (hot soup and sandwiches). On all of the routes you will see incredible scenery - open marshland, lakes, rivers and forest glen along with many other hidden gems – plus you’ll get to experience the beautiful changing light of the Arctic throughout the day. After this full day of mushing you’ll reach your overnight camp, the dogs will be bedded down for the night and then you will be free to relax whilst waiting to enjoy your supper. You can start the day with either helping feed the dogs or relaxing and taking in your wild surroundings, before making your way back by sled to the farm. For many people, this day is the highlight of their trip since they are, by then, comfortable with both their dogs and with mushing itself, and there is more chance to relax and marvel in the scenery. Once you have arrived back at the farm, you can help put your team of dogs back in their kennels, say goodbye and then have a last hot drink and snack before returning your borrowed kit and picking up anything you left behind. You’ll have some time to chat through the highlights of the trip and provide some feedback before you’re dropped off at your hotel in Hetta – where you can hang out together, swap photos and have a well-deserved meal and enjoy a hot sauna experience. If you have energy to spare and are feeling brave there are several places in Hetta where you can try some ice-hole swimming! You’ll get a group transfer back to Kittilä in time for flights home (time TBC). You can also get advice and help on other things to do and see in Hetta if you plan to extend your stay. This safari does not require a high level of physical fitness. However, please note that you will be outside in the cold for many hours each day and the dogs will appreciate it if you can both help them on up-hills and be agile enough to both brake and steer appropriately on down-hills (you’ll be shown how to do this). Even being moderately fit will stand you in good stead! EC adventures are informal, friendly and great fun! They're made up of singles, couples and small sets of friends with ages typically ranging from mid 20s to mid 40s but anyone over 18 years old and young at heart is welcome. Whether it's your first time exploring the outdoors or you're an adventure professional, EC adventures are a great way to meet like-minded people in a safe, welcoming and fun environment. The once in a lifetime opportunity to get hands-on with the dogs every day, helping the guides with activities such as feeding and grooming, taking them for walks, and maybe also doing agility exercises with the pups! You’ll have the chance to get involved as much as you want to and we highly recommend this to bond with your dogs and get the most out of the trip. Please download the document HERE for recommended flights and advice. Please see HERE for our recommended kit list to bring for the safari, plus detailed information about keeping warm and how to dress in the Arctic.